No one likes an uninvited dinner guest, especially on your honeymoon, but one couple made an exception for an extremely cute sea lion in Mexico. 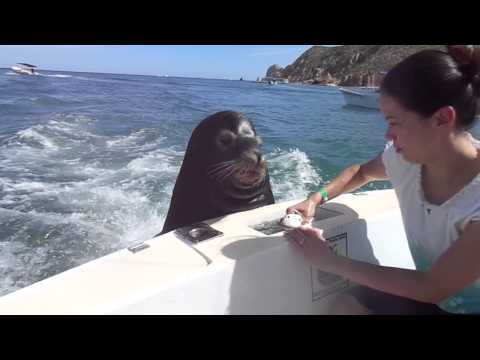 The couple were enjoying their break in the honeymoon destination of Cabo San Lucas when a sea lion hitched a ride on the back of their boat looking for a snack. Fortunately for him the couple were impressed by his stunt and the new bride handed him over some fishy treats. Once on board the sea lion showed exceptional manners waiting patiently for more fish to be fed to him and gently took his fish out of the bride’s hand. The sea lion is reportedly a celebrity in the area and goes by the name of Pancho. Rachel Leng posted the video on YouTube and it has already been viewed nearly 700,000 times. Pancho is apparently no stranger to hopping onto the back of boats and other clips captured by tourists and fishermen showing him pulling off similar stunts. In one clip he even steals a fisherman’s catch while he proudly displays it to the camera. Pancho is not the only audacious sea lion in the world. Last month a San Diego yachtsman was awoken by a sea lion intruder that had climbed on board and fallen asleep.